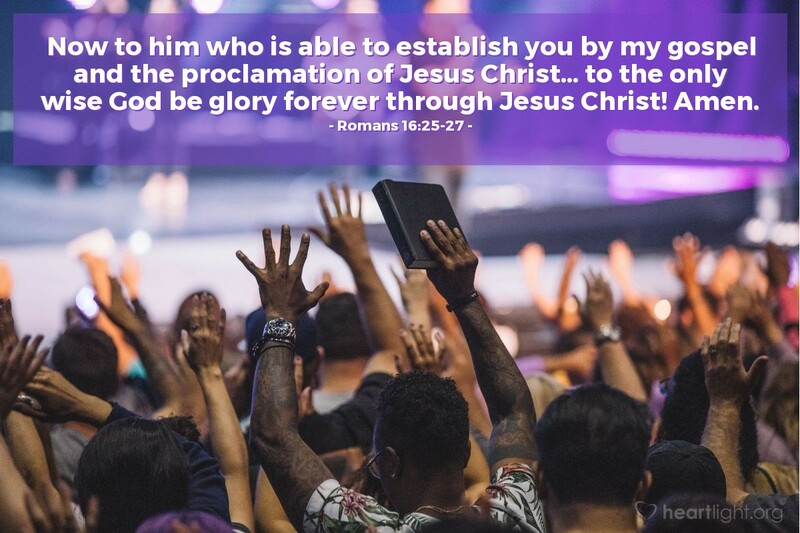 Now to him who is able to establish you by my gospel and the proclamation of Jesus Christ... to the only wise God be glory forever through Jesus Christ! Amen. God doesn't just bless us. He establishes us! He makes us strong! He matures us into solid and true disciples. He does this in many ways. One of the most important, however, is through the words the Holy Spirit inspired and shared with us through Jesus' early disciples. As this year moves towards its close and another stands at the door, let's make a renewed commitment to spend time each day in the Bible. Let's not let this powerful tool and great resource for living be relegated to being a coffee-table book or a good luck charm to take with us to church. I thank you, O God, for your Spirit that breathed out your message through human agents. I thank you for those human partners who shared the Spirit's message with us in Scripture. I thank you for the many fine translations of the Bible that are available to us today. I thank you for the freedom to have a copy of the Bible in my home. Please help me not squander the incredible blessing of your written word. In Jesus' name I pray. Amen.